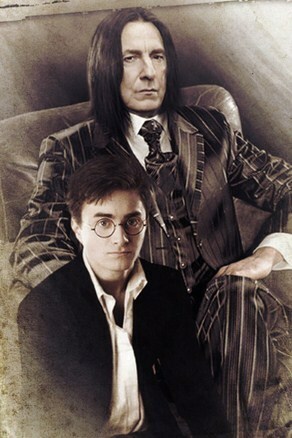 snape and harry potter. . Wallpaper and background images in the severus snape club tagged: alan rickman harry potter snape. This severus snape fan art contains bien vestido persona, juego, juego de pantalones, traje pantalón, persona bien vestida, traje, pantalones traje, pantsuit, and pantalones de traje. There might also be traje de negocios, juego de negocio, retrato, tiro en la cabeza, primer, headshot, primer plano, en la cabeza, and closeup. I love this! It's a great inspiration for an AU story...Severus Snape survived the War, was vindicated by Harry, personally helped to rebuild Hogwarts, and went on to become Minister for Magic. Harry completed his education and became the youngest Head Auror in Wizarding history.